Hello friends! 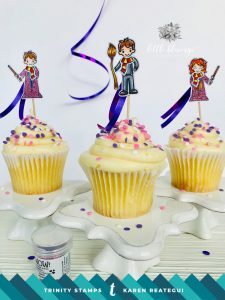 Today it’s party time at Trinity Stamps Blog! 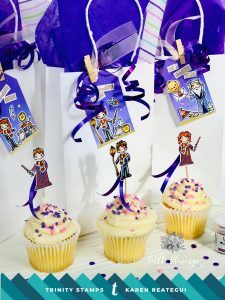 So join us and get some inspiration with these cupcake toppers and tags to decorate favor bags. 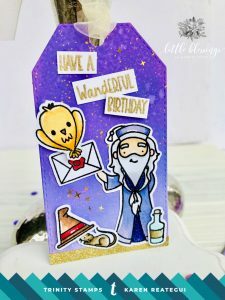 In today’s project I’m using the Magical Wizards, Wizard Friends and Magical Sentiments stamps and dies from Trinity Stamps. 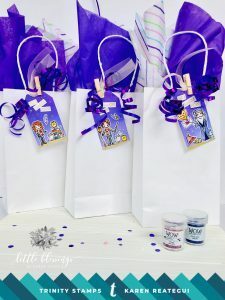 The embossing powders used are Velvet and Purple Glitz from WOW! Let the party begin! 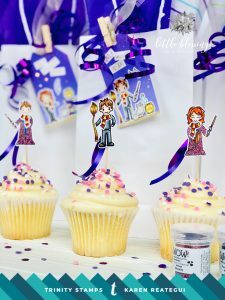 To make the cupcake toppers I started by stamping the images onto white cardstock and colored them using Copic markers. Only two characters had their robe heat embossed with WOW! Velvet embossing powder. Then, using the coordinating dies, I die cut the images. Attached the toothpicks at the back of each character and added a piece of purple curling ribbon. 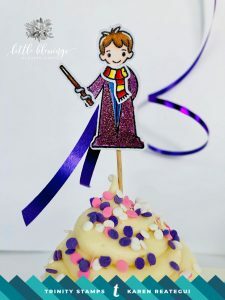 I inserted the toppers on each cupcake and I loved how they looked. 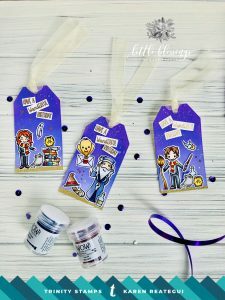 For the tags, I started by stamping the images onto white cardstock and colored them with Copic markers as well as I did with the toppers. I die cut all images using the matching dies. 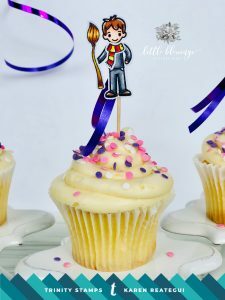 Once, I finished this step I heat embossed the inside of Dumbledore’s rope with WOW! 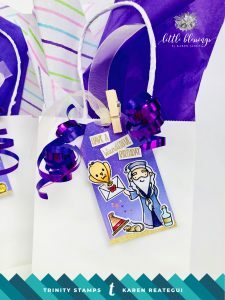 Purple Glitz embossing powder. The picture doesn’t make justice but in person it’s looks awesome! Next, I placed a tag die on top of a white cardstock and run it through my die cutting machine. 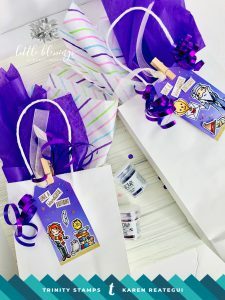 Then, I applied Wilted Violet and Shaded Lilac Distress Oxide inks to the tags. I spritzed some water and bottled off the excess. Once it was dried, I added some splashes of gold ink from Hero Arts. 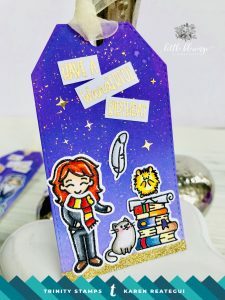 Then, I added a piece of gold washi tape from Trinity Stamps, at the bottom of each tag. I arranged the characters and other images on top of the tag. Additionally, I stamped all the sentiments using WOW! Metallic Gold embossing powder and added them to the tags as well. Finally, I added some stars from the Imperio Glitter Confetti Embellishment Mix from Trinity Stamps. And as the final touch, champagne ribbon was added to each tag. 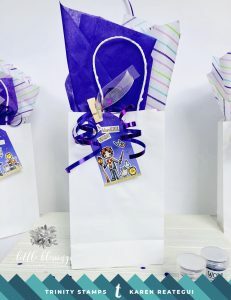 I decorated the favor bags adding more purple curling ribbon to the back of the tags and hold these pieces using clothespins. 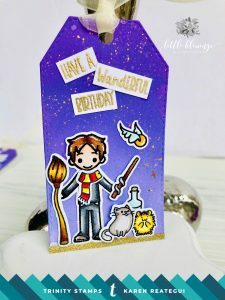 This is another great use of your stamps! I hope you loved these ideas and decorate your Harry Potter birthday party! It’s very easy and looks amazing. how awesome, love the use of the vibrant colors! Thank you so much beautiful Amy!